Like a short priced favourite at a Rosehill race meet, the Australian Bus and Coach Show romped home to resounding success last week, supported by leading suppliers, operators and the public at large. There were one or two ‘show stoppers’ at the event, including 2GB’s Ray Hadley, pictured, who gave his own insights into success at the ZF-sponsored industry lunch – leaving delegates with a message from his personal career experience to ‘never give up’. former race caller Hadley taking the stage, as an estimated 1,500 people poured through Rosehill Gardens racecourse turnstiles in Sydney’s west for the two day event. Organised by BusNSW, the Association’s Executive Director Darryl Mellish says feedback from exhibitors indicated a high degree of satisfaction at the show’s quality. With the NSW Government currently setting up Transport for NSW, the bus and coach industry exhibited vehicles, products and services required to meet future NSW and Australian public transport challenges, and enhance the customer’s experience. "It was an ideal time to showcase the bus and coach industry with a new Government undertaking reforms and new people starting in key positions within Transport for NSW," Mellish says. Leading manufacturers displayed over 80 vehicles worth more than $40m at the show. "Visitors to the show had an opportunity to check out the latest engine, transmission and diagnostic technology, as well as new state of the art body designs," Mellish says. Australian and International bus builders displayed new chassis and innovative high capacity vehicles designed for mass transit. Inside Sydney’s Rosehill racecourse exhibition halls, 100 exhibition booths displayed products, services and tourism information, with steady streams of visitors flowing through the exhibitions across the two-day event. "Show attendees had an excellent opportunity to evaluate and source different products and services at the one location" Mellish says. Show and Conference Director Matt Threlkeld commended the exhibitors for their high quality stands and strong commitment to make the show a success. Mellish says BusNSW was already looking ahead to the 2013 show, with initial planning and a review of the 2011 event under discussion. "BusNSW will formally survey all exhibitors to ensure continuous improvement for the event," he says. "We would also like visitor’s feedback to assist with planning for the 2013 show and have set up a feedback email on the Australian Bus and Coach Show website, www.busshow.com.au." 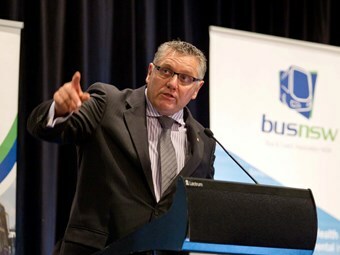 The BusNSW Conference held in conjunction with the show was also judged a success. The conference focused on strategic policy directions as well as providing important operational information for operators, government and suppliers. On the opening day, the Conference Program featured an address from Department of Transport Director General Les Wielinga on "Transport for NSW - A New Era", followed by a NSW industry report ‘Taking it to the Streets" delivered by Mellish. Other presenters included BIC Executive Director Michael Apps, and ITLS Director Professor David Hensher. "Delegates also applauded an inspirational speech from Steven Bradbury, Australia's first Winter Olympic Gold Medal winner," Mellish says. And an Industry Forum including a panel of BusNSW, Department of Transport and RTA representatives engaged in lively discussion on a range of key issues. A highlight of this year’s Australian Bus and Coach Show was the industry awards presentations at the Mercedes-Benz gala dinner. With master of ceremonies John King steering proceedings, some well-known and perhaps a lesser known face appeared on stage to receive their awards, presented by NSW Transport Minister Gladys Berejiklian. Taking out the year’s Outstanding Contribution to Industry award was Prime Works Software Solutions Director David Cheng, a long time ‘backroom’ software engineer who has been instrumental in the design of much of Sydney’s bus-based information technology for almost three decades. Cheng says he had no idea he was going to win the award, and was shocked at hearing his name read out during the citation. "I didn’t know what to say, and thought about all the things I should have said when I got home later that night," says Cheng. Nevertheless, the unassuming software ‘guru’ received thunderous applause on accepting his award, recognising the role he had played in bringing the NSW bus industry into the modern era of bus scheduling, planning and – more recently – internet based cloud computing and module integration. More recognisable faces joined King and Berejiklian on stage, with Custom Coaches Managing Director Mark Burgess accepting the Supplier of the Year award, and former Transport NSW Director General, now Comfort Delgro Cabcharge CEO Jim Glasson receiving the Environmental Operator award. All up, it was a great show which can only get bigger when it rolls around again in 2013.